Do the Monkey with WHAM-O! Apollo XII and Phast Phreddie the Boogaloo Omnibus swing at the WHAM-O WATUSI! On July 7, The WHAM-O WATUSI returned to its international theme with guest DJ Julio Fernandez, AKA DJ Apollo XII, who is from Spain. The WHAM-O WATUSI, of course, is held on the first Saturday of the month at the Bootleg Bar in beautiful downtown Bushwick, Brooklyn. For the last eight years or so, Mr. Apollo XII has been living in Lancaster, Pennsylvania. He is a musician who plays drums for the cool rocksteady band The West Kensingtons, based in Philadelphia. He is also an avid record collector who takes advantage of the many record collecting opportunities presented to those who live in the south-east area of the state. About three or four years ago he and DJ Salinger started the Red Rose Soul Club. It did so well that Mr. Apollo, along with the noted British Northern Soul DJ and record dealer David Raistrick, who also has a pad in Lancaster, put together the Keystone State Soul Weekender–a fabulous affair held in November that features DJs from around the country and flown in from England. 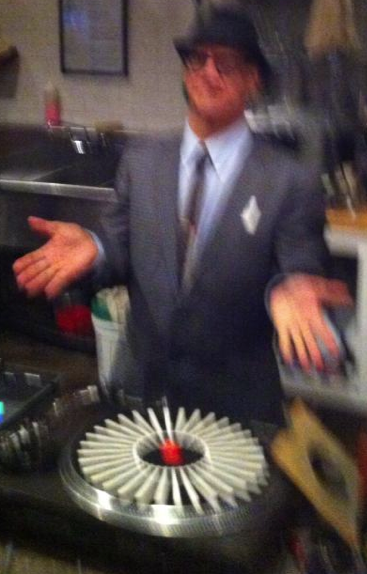 Suffice it to say, Mr. Apollo is hip to the scene and has records that are clean! We were happy to see our pals Eric Svirida and Miss Claire who blew in all the way from deep Long Island. Mr. Svirida hosts the Flip Side Soul Club in Philadelphia; and we’ve seen him in action at the Keystone State Soul Weekender. Miss Claire, Apollo XII and DJ Eric Svirida swing at the WHAM-O WATUSI! Apollo XII and Phast Phreddie the Boogaloo Omnibus are in a pensive mood at the WHAM-O WATUSI! For his part, host DJ Phast Phreddie the Boogaloo Omnibus played his usual trash–that is to say rockin’ instrumentals, garage rock, soul, R&B, a couple Mod movers and a few that were recorded in Spain. 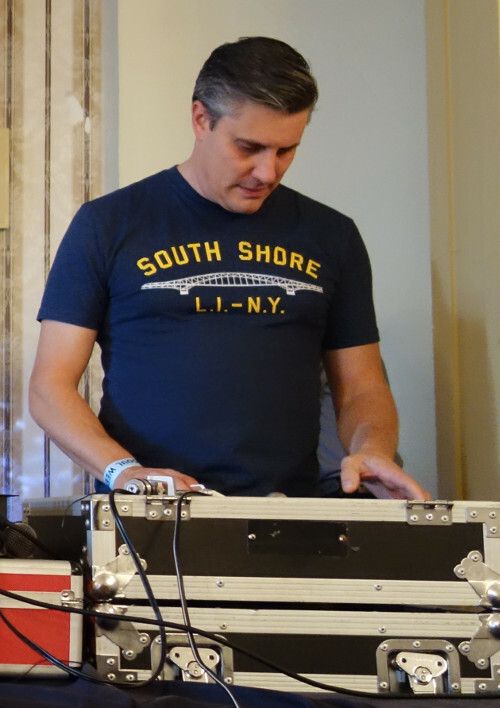 Recently, our new pal DJ Parka Pat from Montreal shared a blog post of his Top Twenty Monkey Records on The Boog’s facedog page. The Boog replied with a list of more than ninety monkey records that he has played over the last five years or so. When getting ready for this particular WHAM-O, it reminded The Boog that he has yet to play some of his favorites; thus a set of eight more monkey records were played. However, none of them were as good at the one Mr. Apollo XII played!!! Nancy “Jeannie” Gardner once again rose to the occasion by making excellent chocolate crinkles, banana bread and vegan brownies. The BOOGALOO BAG writers are thinking about turning the WHAM-Os into a bake sale in order to generate extra cash to buy records!!! Apollo XII is eyeing the fabulous treats baked by Miss Nancy at the WHAM-O WATUSI! None of these records are for sale. Some of them have links to the Youtubes, click on them for outstanding audio action!